“My elevator speech is ‘Culinary Corps is the Peace Corps for cooks,’ says founder and director Christine Carroll. Carroll, a professional chef, founded Culinary Corps in 2006 after attending a conference in New Orleans and identifying a gap in the existing volunteer services. The result is Culinary Corps, which designs, organizes, and facilitates volunteer experiences for skilled culinary students and chefs. 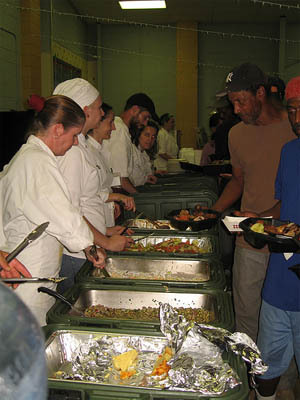 Currently, Culinary Corps’ efforts are focused on providing services in New Orleans, and the next trip is scheduled for June 1-6, 2008. Volunteers pay their travel expenses to and from New Orleans in addition to a nominal fee that covers on-the-ground expenses (housing, meals, and ground transportation). Volunteers are expected to work together as a diverse team to fulfill each day’s cooking tasks, as well as participate in all planned activities with community hosts and partners. Bonus Points for Culinary Corps! -Lodging is provided by Xavier University, a historically black university with the ultimate purpose of promoting a more just and humane society. -Each trip involves hands-on learning experiences for participants. Culinary Corps provides a pre-trip package with resources about local food and local culture, and organizes events that bring participants into direct contact with both. Past events have included a tour of the Crescent City Farmer’s Market and meals with the curator from The Southern Food and Beverage Museum. 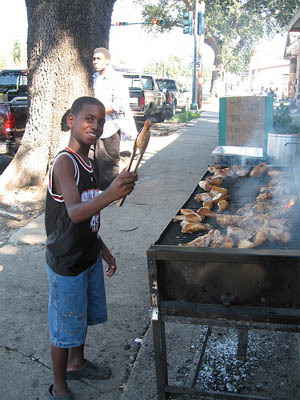 -Culinary Corps is currently planning expansion of its volunteer activities to include a service trip to Nicaragua in November, 2008. For full details about Culinary Corps and to download an application and instructions, please visit http://culinarycorps.org. (The application for the June 2008 trip will be available March 1).